There have been three days of unrest in Hawassa in southern Ethiopia with at least one fatality and many injured after Sidama protesters’ demand for their own regional state was accompanied by violence. Police and soldiers are trying to control the situation after hotels and businesses were attacked, a resident said. “We have been hearing gun shots the entire afternoon,” they said in the evening of June 14. At least one person died in unknown circumstances on June 13. Adare Hospital is “crowded” and there are more than 50 seriously injured people at Hawassa Referral Hospital, the witness, who did not want to be named, said. “Those who are orchestrating the chaos are from the native people of Sidama and they are claiming the land belongs to them only and any other clan should be kicked out. Houses are raided since yesterday. They are breaking into homes and stealing property and beating people,” they said. Hawassa is the capital city of the multiethnic Southern Nations, Nationalities and People’s Regional State (SNNPRS) as well as the administrative centre of Sidama Zone. The Sidama people have a longstanding claim to have their own state in Ethiopia’s federation. Around 100 people may have been killed by security forces in 2002 when similar demands were made. 10 people died in the violence, 89 were injured and 2,500 displaced, including many Wolayta, Fana Broadcasting Corporation said on June 16. Prime Minister Abiy Ahmed plans to visit Hawassa next week. Recent violence occurred in the aftermath of the cultural Chamabalala festival and has included attacks on Wolayta people, who are from the same region, the witness said. Large hotels were invaded in the popular resort town and are now controlled by security forces. Another account said security forces shot people at a teacher training college today and six have died overall. “The situation is fluid and dangerous,” they said on June 14 evening, alleging the violence was the result of outside provocateurs. The situation was calmer on the morning of June 15 with no public transport but police patrolling the street. The city is home to Hawassa Industrial Park, which has attracted international textile and clothing companies over the last two years. There has also been renewed serious recent violence between the Gedeo and Oromo people on the border of Oromia’s West Guji Zone and Gedeo Zone in SNNPRS, UN OCHA said on June 6. There have been civilian deaths, property damage, and more than 400,000 people are displaced, including 70,000 this month. All the displaced in SNNPRS are Gedeo and 67 percent of the displaced in West Guji are also Gedeo, according to OCHA. Displaced Wolayta people in Hawassa city. 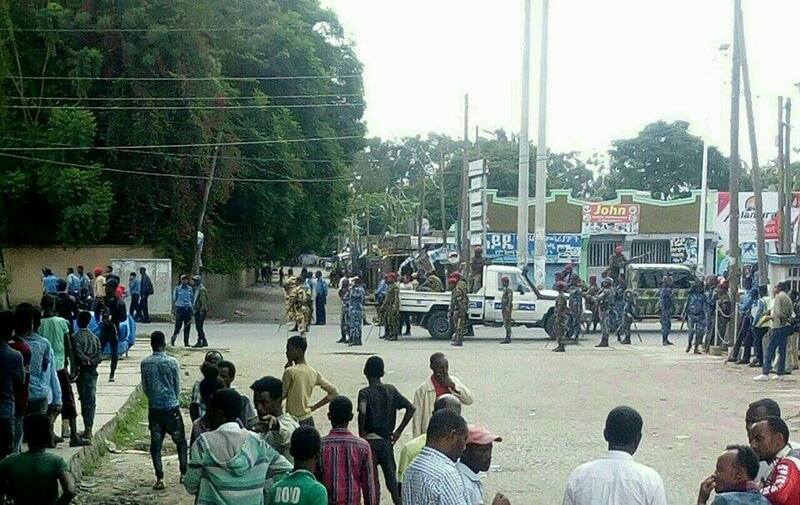 Main photo: Unrest in Hawassa city on June 14. ¿Se puede viajar al país Sidama sin peligros de altercados como los de junio? EN pleno siglo XXI, la fuerza se impone a la razón, es decir, la razón de la fuerza, ¿ nosomos capaces , los humanos, de avanzar hacía un concepto de la tierra, el planeta Tierra,que es nuestra Wereda, y nuestra estancia en ella es tan rápida que merece la pena resolver los conflictos de otras maneras?. Más humanidad, más Amor entre humanos, todos somos humanos, demos un salto a nuestras mentalidades, hagamos del espacio el lugar de descubrir cosas nuevas,..Gracias por informar de Etiopía, es muy dificil encontrar las cosas que pasan por esos lugares de nuestra Wereda Tierra.